When you can get conservatives and libertarians to admit that global warming is real, serious, and caused by humans, almost inevitably they start pointing fingers at India and China. What is the reality of the USA’s contributions to global warming vs the rest of the world’s? 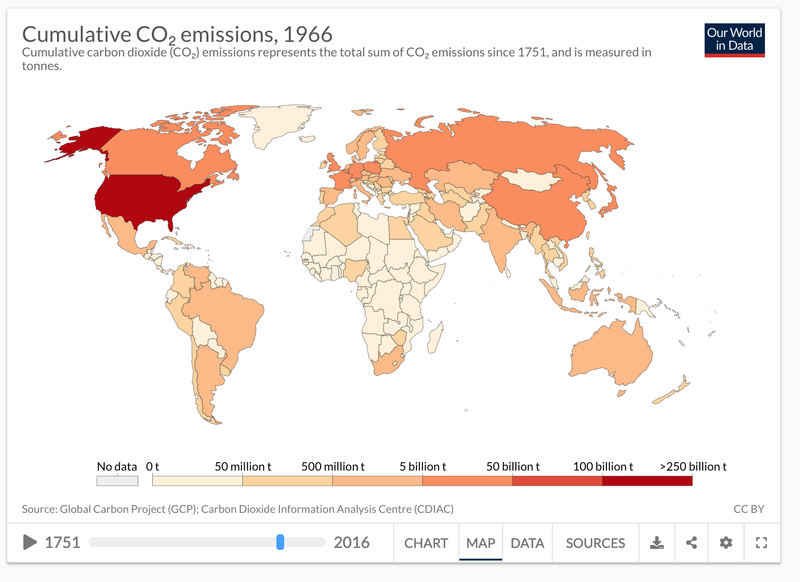 It’s worth casting our eyes back over different points in history with visualizations from Our World in Data’s site CO₂ and other Greenhouse Gas Emissions to help answer this question. Let’s start at the turn of the 20th Century. 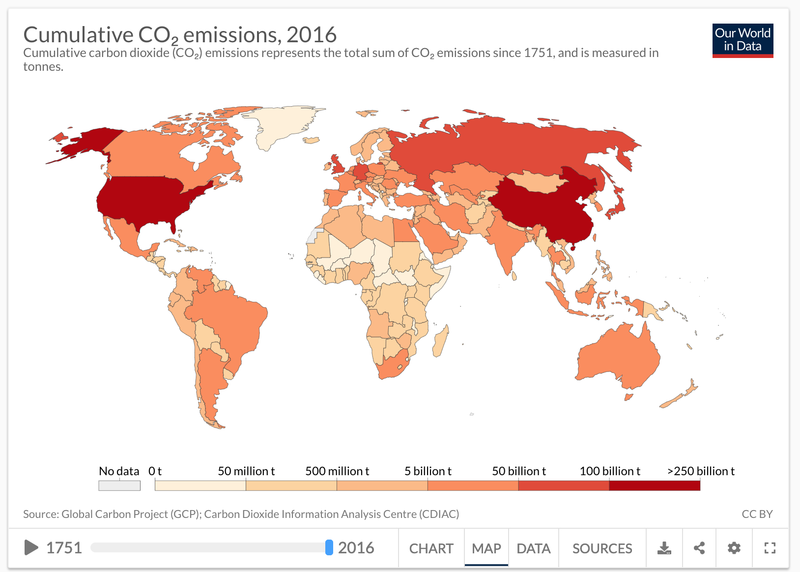 Which countries were already racking up big emissions? The UK was in the lead with 17.7 billion tons as befits its status as origin of both the steam locomotive and the Industrial Revolution. The USA wasn’t far behind at 11.4 billion tons. Germany was lagging at 6.73 billion tons. China? 95 thousand tons. But things have changed since then, right? Oh, yeah. Let’s fast forward to 1966. Hmmm… what’s that intensely dark country? The USA with its 138 billion tons it looks like. China is at 7.6 billion tons, basically where Germany had been 65 years earlier, but with a lot more people. At this point in time, only the UK, France and Germany had broken into double digit billions, while the USA had rocketed past triple digits. But things are all better now, right? The USA is great again and emissions are falling. China and India are the evil bad guys, right, not the folks in the USA? Ummm, no. It takes about 300 years for CO2 to leave the atmosphere and the USA is responsible for more than any other single country. By 2016, it was a hair under 400 billion tons of CO2 cumulatively. Evil baddy China was less than half the total historical cumulative emissions of the USA with four times the population. As of that point, any eight Chinese people might share about as much culpability as a single American. Meanwhile, India is under 50 billion tons. Except for China and the USA, no other country is over 100 billion tons.